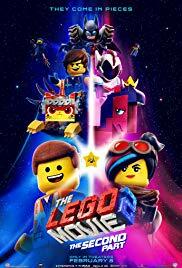 Last Tuesday night Neil and I went to see The Lego Movie 2. I mean sure it was a bit of fun. But it was a bit more disjointed and didn't seem to flow as well. I did recognise what's his name's hair (won't give any other info because spoilers). They made fun of the catchy song from the first movie with a new "catchy" song. That was so catchy I couldn't remember it by the end of the movie. Definitely not as memorable as the first one. I think they should have sung Everything is Awful instead of Everything's Not Awesome. That's what I do hehe.